For a long time Cwmcarn had come under some criticism with only one XC trail and one short DH trail. Many trail center users were choosing to visit the near by Forest of Dean with its wider selection of MTB trails and forest routes or to travel further west to Afan for a bigger all mountain fix on Skyline, Y Wal or the grueling Whites Level. Cwmcarn was being left behind. The locals (of which I know many) barely ride there, opting to ride their own trails that frankly offer a much better time for experienced riders. 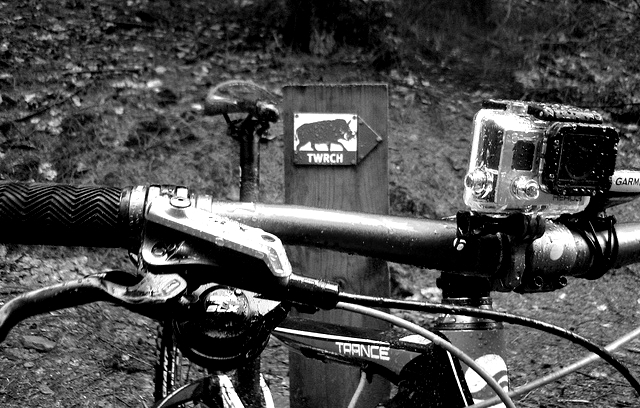 In late 2013 Bike Park Wales opened less than 45 mins drive away threatening the very existence of Cwmcarn’s classic Twrch Trail, a trail that so many riders cut (and broke) their teeth on. 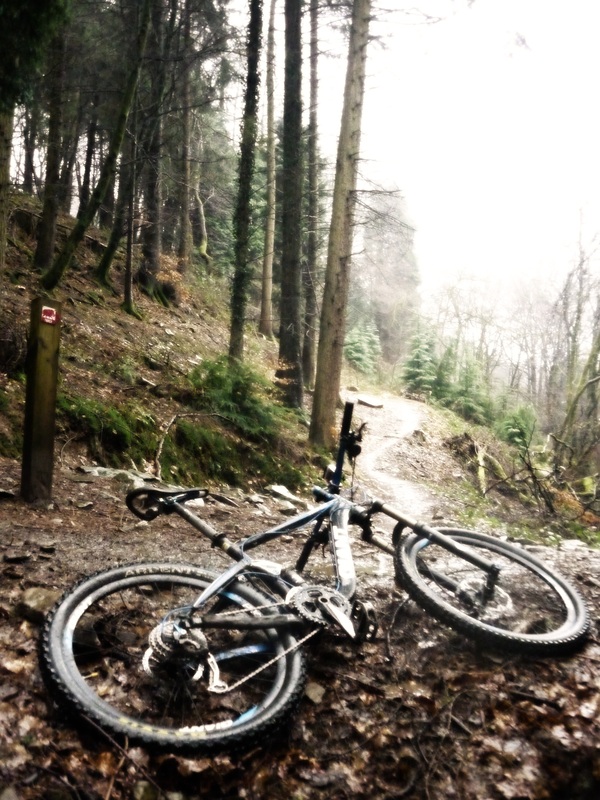 Cognation had a job to do if Cwmcarn was still to have a place in the Welsh MTB landscape. The hills and forests around Cwmcarn have some fantastic “local” trails with steep descents and great natural riding – Cafall was going to need to deliver something special when it opened in February 2014. Many local riders knew of its existence long before the opening and probably had a small hand in shaping it. These trails aren’t built over night, they are cut and run and re-cut and ridden many times before you and I get a peak! I have ridden the trail many times now and I can tell you its great. The Twrch Trail has been noted for its technical climb and long flowing descent – Cafall offers something a little different. By the time you have reached the 400m peak of the trail through some tiring sections such as QUADZILLA you will be well and truly warmed up for the descents! Split into a number of distinct sections with names like Voodoo, Powder House, Riddler and Rocky Valley. Each has slightly different feel – from tight wooded sections to loose rocky off camber stretches, it challenges you all the way to the finish. The trail feels natural which will surprise many trail centre visitors, who are looking for a somewhat sanitised experience, but this is the appeal for me. Even the locals like it and Cwmcarn has been seeing good visitor numbers again as a result. Cafall is a great trail and earns its RED grading on two counts – the climb is not for a novice (at least not one that is in a hurry) and the descents are tight and twisty with some drops and switchbacks that will catch you out if you don’t know how to ride them. Recently, Cognation opened a Black (severe) graded downhill section called Pedalhounds. Its only 1.4km and will have you at the bottom of the trail in no time if you can ride it. Its rooty, technical and has some features that require some commitment and skill to ride. The only problem with this is that your climb to the top is back on you in only a few minutes if you want another go. There are some options to mix the Cafall descent and the PedalHounds to get the best of the both and you can ride up the fire road to session the last (and arguably best) section called The Kaiser. However its not so good today for Cwmcarn. A large part of the Forest has had to close as they remove infected Larch trees, this means restricted access to the Twrch Trail. We have seen similar activities by the forestry commission at Afan and other woodland based trail centres. Some of the Twrch is still open, all of the Cafall is open and there is still enough riding to entertain you for a good few hours. So please don’t give up on Cwmcarn. Go and ride the Cafall, buy a tea and some cake in the visitor centre and enjoy what you can of one of the original trail centres.